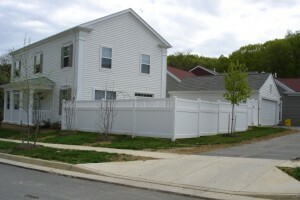 Vinyl fence repairs range from the simplicity of DIY repairs to complete replacement. Vinyl fencing is known for its toughness and resilience. You can expect a good quality vinyl fence, properly installed, to last for approximately 15-20 years and require only minimal maintenance under conditions of normal wear and tear. However, this sturdy fencing material is damage-resistant, not totally damage-proof, especially when unpredictable weather or human error is a part of the picture. Whatever the case, there are several questions to ask before deciding to fix or replace your vinyl fencing. If a Vinyl Fence Has a Crack or Hole In It, Does It Need to be Replaced? The short answer is, “It depends.” A small crack or hole can be repaired fairly easily. If you’re looking at a larger area, it will be more difficult to do a neat, unobtrusive job. However, you may be able to have just one section of the fence replaced. If the fencing is seriously damaged, was put up more than 20 years ago, and/or you would like an update, you might want to consider installing a completely new fence. What Prep Work is Needed Before Repairing a Vinyl Fence? The best place to start is to thoroughly clean the damaged area. Easy-care vinyl fencing is simple to clean up with water and a household cleanser. Wash the fence down with your garden hose or scrub with a brush as necessary. Trim any jagged or protruding edges with a utility knife, followed by a gentle sanding 3″ around the crack or hole. What Materials Are Needed to Repair a Vinyl Fence? For a small repair of a crack or hole which measures less than 1″ to 1 1/2″ in diameter, use PVC (polyvinyl chloride) glue, which is a type of adhesive manufactured specifically for vinyl. Alternatively, you may prefer to work with a solvent that will actually melt the vinyl and allow you to fuse it back together. Larger cracks can be filled with expanding foam, dried, trimmed to fit, and then topped with plastic automotive body filler (available from automobile repair shops) or urethane/epoxy resin. Whatever the size of the repair, finish the job by sanding till smooth, removing all dust, and painting with spray paint. Once a Vinyl Fence Has Been Fixed, Will It be As Strong As It Was Before? No. Unless the damaged section is completely replaced, the repaired vinyl fence will tend to be weaker than it was previously. If high-strength fencing is a must for your application (for example, to surround an animal enclosure), consult a fencing professional regarding the best means of repair. Can a Damaged Vinyl Fence Section be Reinforced? Yes. It is possible to reinforce a section of vinyl fence before repair. Use a wooden 4 X 4 or a length of aluminum or steel to strengthen the damaged area. Are There Any Legal Considerations When Repairing a Vinyl Fence? Major fence repairs or replacement may require a building permit — always check with your local authority before beginning work. If the fence is shared with a neighbor, he or she may be obligated to share in the cost to repair your vinyl fence. This entry was posted on Friday, April 29th, 2016 at 4:12 pm. Both comments and pings are currently closed.